Design freezes, looming installation deadlines, and a wall-sized draft installation schedule turn the semi-annual gathering into a working meeting. LUND—The 13th In-Kind Collaboration Meeting for Neutron Science at the European Spallation Source (ESS), IKON13, was held over four days in the final week of September. With the first hard deadlines for instrument procurements and installations around the corner, the meeting has taken on a sharper edge, and is now firmly established as a critical tool in the Europe-wide collaboration to build the world-leading instruments for ESS. This 13th gathering was also the largest by a wide margin, with 220 participants overflowing the conference rooms and meeting spaces throughout ESS’s Lund headquarters. Engineering drawings for the ESS instrument suite, September 2017. Click to zoom. The meeting’s emphasis was on the Neutron Scattering Systems (NSS) integrated project schedule, the 2018 "early" installations common to all instruments, and the significant progress of the last six months across instrument support areas including detectors, data management and software, optics and guides, sample environment equipment, and the engineering of the common shielding bunker. Instruments are moving quickly toward installation. The first of many staged design freezes has already passed, with others to follow in the next two months; procurement tenders for guides and choppers are being drafted and suppliers are stocking up; important technical baselines for detectors and their electronics have been established. Also of considerable interest to the 15 instrument teams in attendance was Director General John Womersley’s report on the ESS project’s progress both on and off the construction site. Participants were able to see some of the work for themselves on site tours, as well as to explore work-in-progress at ESS R&D labs EMBLA and Utgård. The instrument installation schedule will be heavily dependent on continued progress in all of these areas. It was clear the energy of the meeting was focused on near-term milestones and the push toward the 2018 detailed design reviews. Science Director Schreyer’s plenary talk, however, kept the perspective squarely on the larger goal of early scientific impact at ESS and how best to achieve it. Schreyer presented detailed scenarios for the first decade of operations, with sliding variables for budget allocation, upgrade strategy and the impact of additional instruments beyond the first 15. Schreyer also underscored the most important milestone for the project, and for ESS as a facility: the inauguration of the scientific user program in 2023. Neutron Scattering Systems (NSS) Project Leader Shane Kennedy followed with a presentation bridging the two perspectives, outlining how the instruments project will get from here to there. The interior of the Target Station Monolith, showing cutouts in the concrete for the 42 Monolith beam ports. An instrument's guide will be installed and aligned here, penetrating the Monolith at its assigned beam port to reach just short of the target wheel. “We have 93% of our in-kind requirements in place, and have seen sustained progress in civil construction as well as Target engineering, upstream projects on which our installation schedule depends. The focus in 2018 will be to move the first eight instruments through detailed design and into the manufacturing and procurement phase,” said Kennedy. For the first time, the format of the gathering allowed for extended ad-hoc meetings between instrument teams as well as between the instrument scientists, engineers and the ESS staff tasked with supporting them. The change in format was widely praised and will remain a key element of future IKON meetings. Many discussions at IKON13 centred on the details concerning the first major delivery and installation deadlines for all instruments, which begin in May 2018. 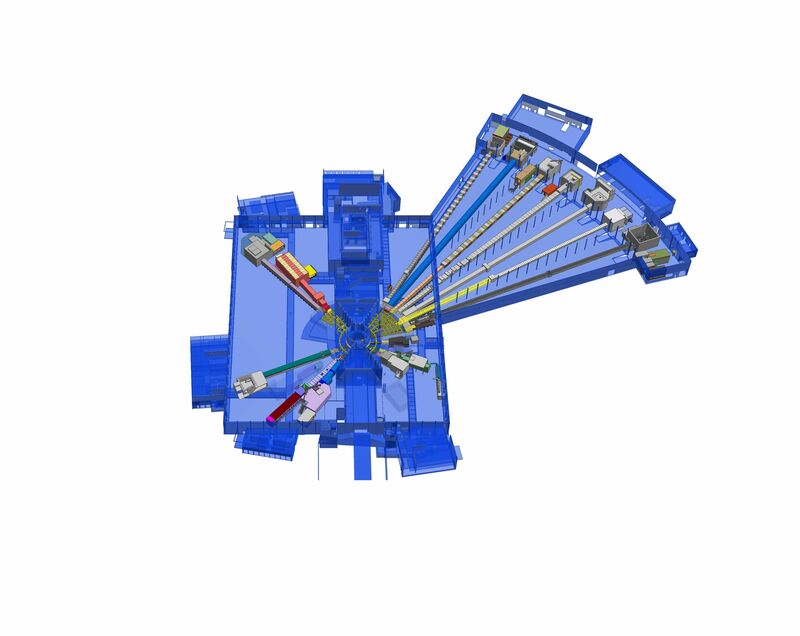 The instruments’ in-Monolith neutron beam optics are to be delivered in the spring, followed by the critical assembly and alignment of some beam guide components in late 2018. This is the effective starting point of the on-site installation schedule that runs through 2023, and will mark the first partial construction site access for instrument teams. The focus in 2018 will be to move the first eight instruments through detailed design and into the manufacturing and procurement phase. Some of the livelier interactions of the week took place during early attempts to detail this massively complex integrated schedule. Many dependencies and uncertainties concerning both the instrument projects and the larger ESS construction project must be pulled together into an action plan for the first five years of instrument construction and commissioning. Kennedy and his planning team, including Sofie Ossowski, Iain Sutton and Antonio Bianchi, held court for several hours gathering as much detail from the instrument teams as time would allow. Using Bianchi’s meticulous but abstract draft schedule as a starting point, one by one the instrument teams were put on the spot and asked to fill in the blanks where they could. Kennedy stood at the front of the packed room filling page after page of a large tablet with detailed notes on delivery and installation logistics, personnel requirements both internal and external, space and machinery requirements, and coordination across adjacent activities. The captured information will be fed back through the schedule, which will be significantly revised for IKON14. Detector electronics testing setup at ESS's Utgård Workshop. Key advances in event formation and readout have been made in a collaboration between DMSC and the ESS Detector Group. A marathon session on detectors and event formation that included presentations from the ESS Detector Group, DMSC, several ESS partners involved in detector development, and a handful of suppliers. Event formation is a key challenge for ESS, which will be the brightest spallation neutron source by up to two orders of magnitude. New approaches to the conversion of raw detector signals to “events” are required. The ESS Detector Group and DMSC are working together on an approach that combines innovations in both detector electronics and software development. DMSC is also working together with the ESS Integrated Control System Division (ICS) to develop the hardware-software interfaces required to operate instruments and to run experiments. Head of DMSC Jon Taylor teamed up with ICS’s David Brodrick to update the instrument teams on these developments. 2018 could be dubbed the “Year of Alignment” for instruments at ESS, as most will be preoccupied with the early installations of their precision neutron guides. The guides will point to the Target moderator and run through the Monolith, then the bunker, the guide hall, the sample cave, and right up to the sample. So all eyes and ears were tuned to ESS section leader for Survey, Alignment & Metrology Fabien Rey’s presentation on the impressive technologies available at ESS. Rey did similar work at the European Synchrotron Radiation Facility (ESRF) and CERN, and was able to give the instrument teams some much-needed information on what to anticipate in this critical installation step. An announcement was made at the traditional IKON dinner that Jon Taylor has been selected as permanent head of DMSC. Taylor was appointed interim head of DMSC following the retirement of Mark Hagen at the end of 2016. "There is unanimous agreement on the importance of scientific computing at large scale facilities in providing high impact science,” said Taylor. “I look forward to leading DMSC and working with our stakeholders to deliver world-leading scientific computing for neutron science at ESS." Taylor came to ESS from the ISIS Neutron & Muon Source in the UK, and in addition to his interim reponsibilities has served as leader of DMSC’s Instrument Data Group for several years. Taylor will lead the effort to prepare ESS for its steep data management and software development requirements. As chair of the Mantid Project Management Board, Taylor is also part of the leadership in the global initiative to standardise software and controls across neutron science facilities. The next in-kind meeting for neutron science at ESS, IKON14, will take place in February 2018, in Paris, jointly hosted by ESS and French partner Laboratoire Léon Brillouin (LLB).